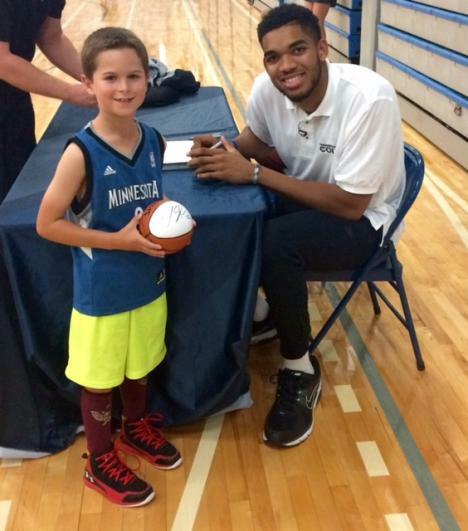 Above is a fan submitted photo with Timberwolves number one overall pick Karl-Anthony Towns. The photo was gathered at a Timberwolves clinic, which took place at Champlin Park High School, in the Twin Cities suburb of Champlin Park, Minnesota. The Kentucky alum signed autographs and posed for photos with kids, including the submitter's son. Earlier in the day, iFolloSports.com also captured original footage of Towns signing autographs at Fan HQ Sports Apparel And Collectables, in the Twin Cities suburb of Minnetonka, Minnesota. The following day, Towns threw out the first pitch at the Minnesota Twins game at Target Field.